Canada Post’s big grey super-mailboxes have become a sad symbol of fiscal rationalization brought on by the demise of the tactile personal letter. In major cities there has been pushback from citizens, unions, and city councilors about why door-to-door service needs to end, where exactly these boxes will sit, and how they will affect their neighborhoods. The Office of Creative Direction Toronto (CDTO) proposes to tackle this problem like a creative director would, by seeing it as an opportunity for reinvention: offering prototypes, evolutionary sketches and models for further research. To investigate the design of these boxes and the spaces around them is to discover how they could work better for people. We feel the best way to do this is not by online survey but by gathering a select group together to form a test office of creative direction. The group would include design thinking professionals representing the fields of theatre, technology, engineering, accessibility, alternative energy, small business and storytelling. Design pushes us to consider super-mailboxes not just as deposit and retrieval objects, but further as animated spaces for shared communication, business, innovation, and community. Imagine that one of the compartments included a seed exchange. Another, a compartment that plays CBC radio podcasts. Another simply marked, ideas. Could the structure be retrofitted to include solar panels that powered a small espresso machine run by a local entrepreneur? Could the super-mailbox glow in the dark? What if there was a digital community board for micro-exchange between neighbors? 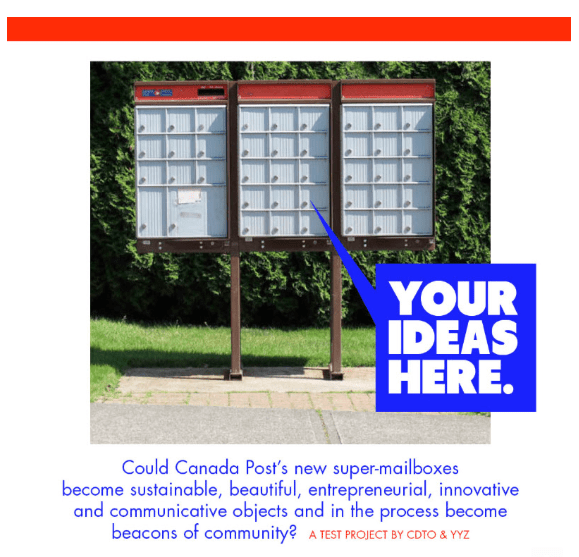 What if the site of super-mailboxes became a forum for revitalized communication between residents and government? We feel the possibilities are endless and deserve more than an online survey they need to be sketched out. June 22 26 CDTO is setting up a test office at YYZ gallery in the 401 Richmond building (itself a successful cultural hub of city building and community innovation). Opening night will include a panel discussion. The workweek will be open to the general public who can observe focused design, rapid prototyping and ideation. Closing night will include a presentation of our findings and along with a comprehensive design proposal for Canada Post. We are in the process now of gathering together a team of specialists, thinkers and makers to work during the last week of June with the support of YYZ gallery as well implementing a 3D printer, and other presentation and prototyping hardware. By 2019 door-to-door mail delivery will be phased out throughout Canada. Because of population density and complexity the last areas affected will be the downtown core of large cities such as Montreal and Toronto. The community mailbox initiative is a five-year project with Canada Post beginning the conversion in every province, consulting with communities through online survey. In the last ten years, Toronto has undergone a swift but surefooted cultural, artistic, and technological renaissance that has not always been met by a blossoming of innovation at City Hall. Following the lead of Mexico City, Manchester, New York, and Boston, CDTO proposes an Office of Creative Direction for the City of Toronto to help mobilize and facilitate cultural innovation while prioritizing design thinking and the way Toronto tells its story visually. Prominent early supporters of the initiative include Leslie Feist, Ken Finkleman, Shary Boyle, Shauna Levy, Sarah Diamond, Sarah Fulford, Richard Florida, John Macfarlane, Rotman CEO Jamison Steeve, and David Mirvish. Jason Logan is a design strategist, creative director, author and educator. He was founding art director at the Walrus, creative director at Roger’s Publishing, a regular contributor to the New York Times and the founder of the Toronto Ink Company. He was chosen out of hundreds of applicants as a 2015 Agent of Change by The Centre for Social Innovation for his CDTO campaign. YYZ is an internationally acclaimed gallery supporting artists since 1979 in Toronto. With a mandate to lead the advancement of Canadian culture through presenting and initiating critical and engaging projects YYZ is a publisher, enabler and space for contemporary cultural conversation. Special thanks to our new sponsor Junction Craft Brewing.